As I teach workshops here and there, I'm learning that many weavers dress their looms from front to back -- happily so -- or using a hybrid method rather than beaming back to front. To my way of thinking, because I like to use fine yarns, back to front is the only way to go. Mainly, you avoid that extra pass through the heddles and the raddle, which can abrade the warp and invite knotting and other problems. 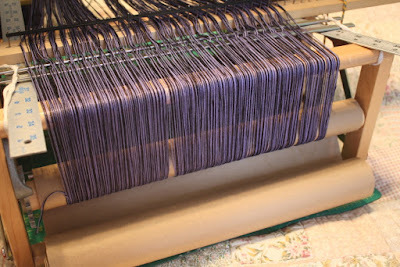 So I thought I would blog about a method that I hope most weavers will try at least once, just to see whether it works for them. 1) Place a sturdy rod in the uncut end loops near the cross. Attach the rod to the back (warp) beam. 2) Lay two slats length-wise across your loom, inside the shafts (with the heddles moved away to either side), spanning from the breast beam to the warp beam, one on each side of the castle. 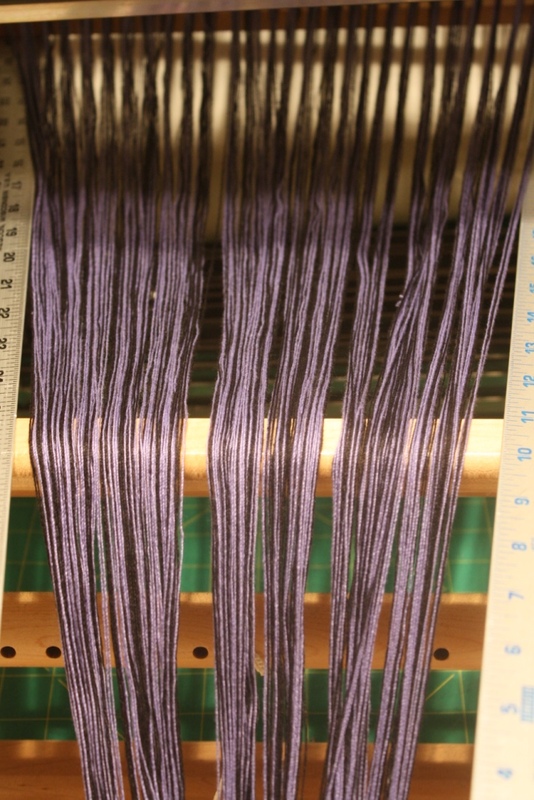 These slats – I use 1-yard rulers on my table loom – will support the raddle and the lease sticks so that they don’t sag or wobble as you dress the loom. 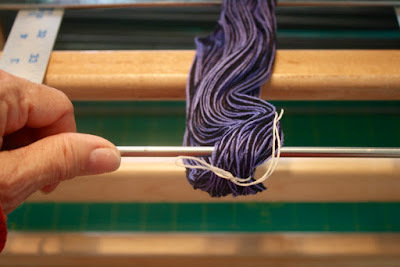 3) Laying the raddle on top of your slats, affix it to the side arms or base of the loom, wherever you can attach it (I use small bungee cords). 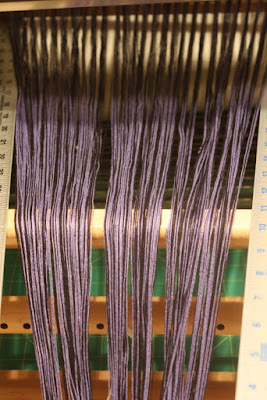 Place the lease sticks through the threading cross in your warp, laying the lease sticks on top of the slats. 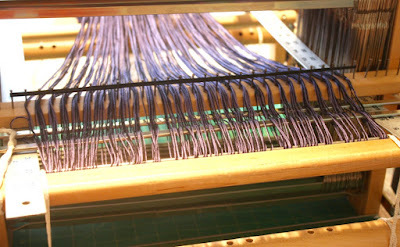 Secure the lease sticks to the sides of the loom between the back beam and the shafts (I run shoelaces through the holes in the lease sticks and then bring the shoelaces around the sides of the loom, tying the ends of the laces together so that the lease sticks are secured). 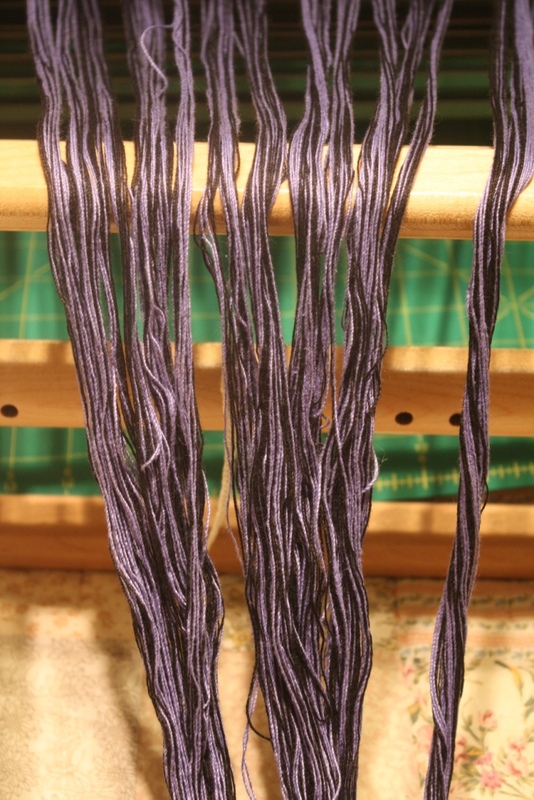 Once the lease sticks are secured so that the warp ends can’t fall off, remove the yarn that secured the cross in the warp. 4) Spread the warp in the raddle. 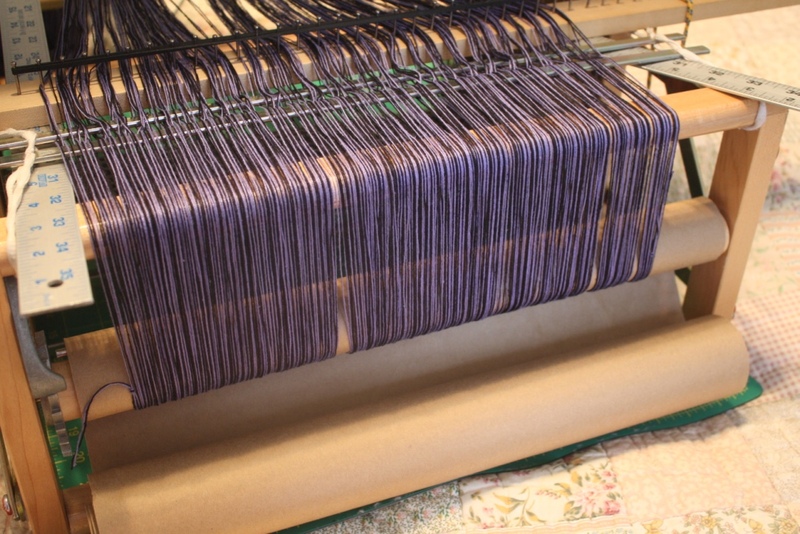 5) Once the warp is spread in the raddle (with the heddles pushed to the sides and the reed removed), drape the rest of the warp chain through the castle, over the breast beam, and down to the floor in front of the loom. 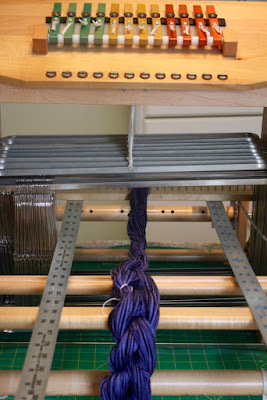 4) Keeping the lease sticks tied in place behind the castle, begin winding the warp onto the warp beam. 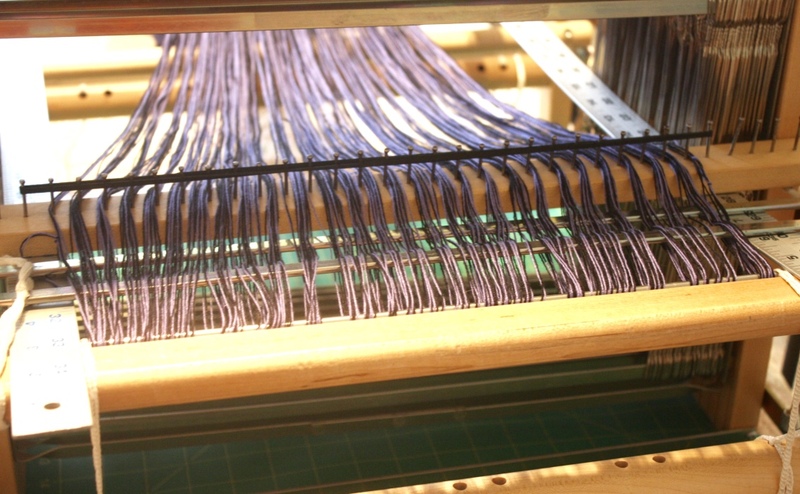 If threads tangle at the lease sticks or anywhere else, go to the front of the loom and pull the warp firmly in sections, combing the warp when necessary to smooth out the threads. the top photo – NOT the bottom photo. 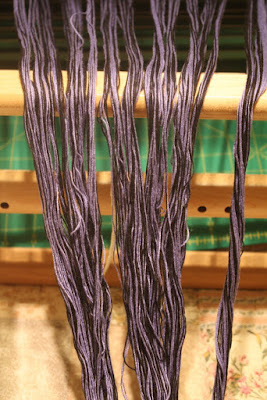 7) Remove the lease sticks (unless you prefer to weave with them in). 9) Tie the warp onto the front apron rod. And then -- weave away! Thanks for reading.